The plaque commemorates 100 years since the First World War began in 1914 and the centenary of the ANZAC landings at Gallipoli in 1915. 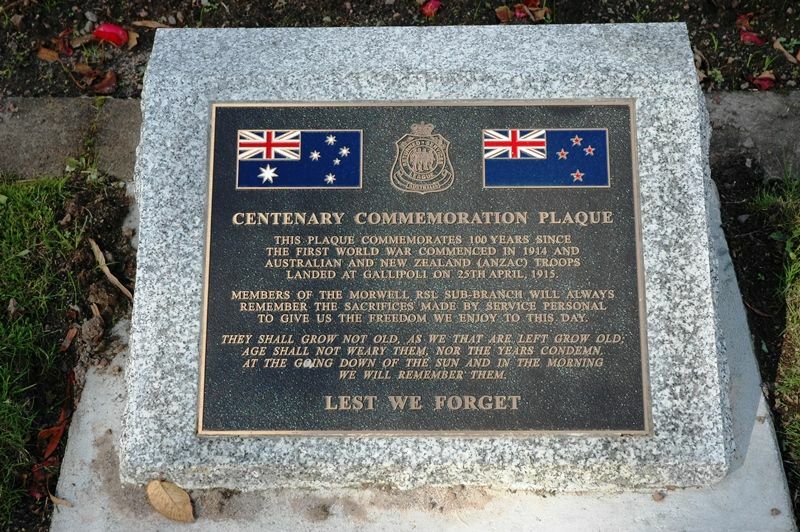 This Plaque Commemorates 100 Years Since The First World War Commenced In 1914 And Australian And New Zealand (ANZAC) Troops Landed At Gallipoli On 25th April, 1915. Members Of The Morwell RSL Sub-Branch Will Always Remember The Sacrifices Made By Service Personal To Give Us The Freedom We Enjoy To This Day.